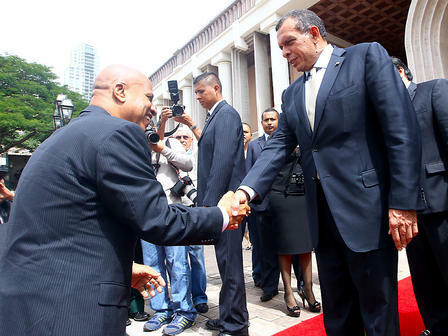 The Prime Minister of Belize, Dean Barrow arrived in Tegucigalpa City in Honduras with his wife Kim Simplis Barrow, where he will be signing various bilateral agreements focused in the areas of tourism, health and cooperation. Accompanying PM Barrow are a few members of Parliament, Belizean Foreign Diplomats and some of his office staff. The Belize delegation consists of the Minister of Foreign Affairs, Wilfred P. Elrington, CEO in the Minister of Foreign Affairs Alexis Rosado, Minister of Tourism and Culture Manuel Heredia, CEO in the Office of the Prime Minister Audrey Wallace, Ambassador of Belize to Honduras Alfredo Martinez, Margaret John of the Embassy of Belize in Guatemala and the Honorary Consul in Honduras Richard Vinelli. 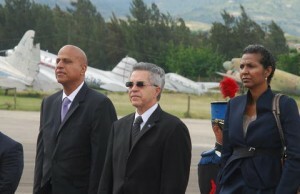 The Prime Minister was greeted at the Hernan Acosta Mejia Air Base, by Presidential Appointee Victor Hugo and Vice Chancellor Berrnica Mireya Agüero de Corrales. Prime Minister Barrow addressed the press and expressed a few word of courtesy. “It is a great pleasure to be in Honduras to further strengthen our bonds of friendship that have traditionally existed between our two peoples. 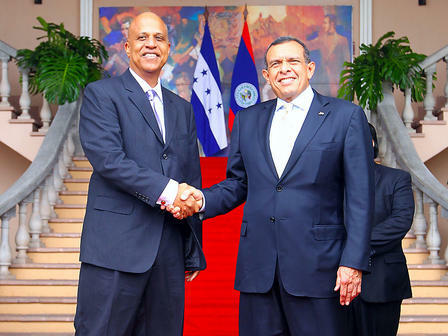 In Belize, our fellow Hondurans are gladly welcomed in our country, “expressed Barrow to the press. Concurrent Belize Ambassador to Honduras Martinez said "It is a historic visit, which is a respond to the visit by President Porfirio Lobo Sosa, in August 2010 and we expect to discuss various bilateral issues incumbent to neighboring countries because they share a border. We also hope to discuss issues of SICA, especially the Central American Security Strategy, the problems facing Honduras and Belize [as it relates to the] drug trafficking trade, in the areas of tourism, security, cooperation, health and education. " 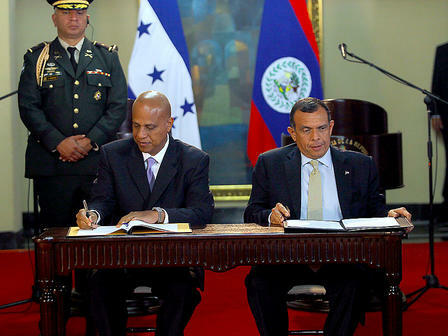 For her part, Vice Chancellor Corrales shared similar sentiment and explained that the visit will revitalize the relationship between the two countries as it will address a broad agenda to address the issues of migration, transfer of Hondurans prisoners who are serving in Belize and the migration of manual laborers. 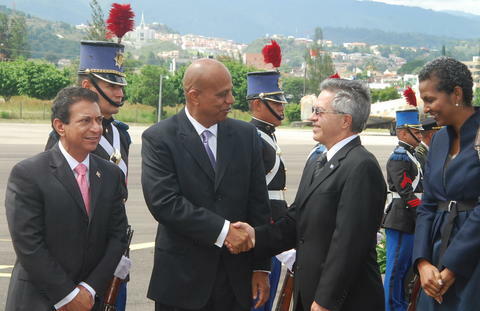 PM Barrow and his delegation was later transferred to Government House in a large convoy where he was received by the Honduran President Porfirio Lobo Sosa and Honduran Foreign Minister Arturo Corrales, which immediately gave way to the bilateral meeting with the participation of the delegations of the two countries. In the afternoon, a working lunch will be held, and the contingency will proceed to sign bilateral agreements in the area of cooperation, tourism and health amongst the two countries. PM Barrow will wrap up his visit to Honduras where he is expected to sign a joint statement and make statement to the media at a press conference. PM Barrow is expected to return to Belize on Thursday November 8th and leaves on Friday to Miami, USA, where he will meet with the Super Bond Team. On Saturday November 10th, he is expected to be on a working visit in Mexico City where he is expected to meet the outgoing President Felipe Calderon.